On the Cetacea’s 2 p.m. whale watch today, we headed north toward Jeffrey’s Ledge after hearing rumors that Pinball and Satula were in the area. 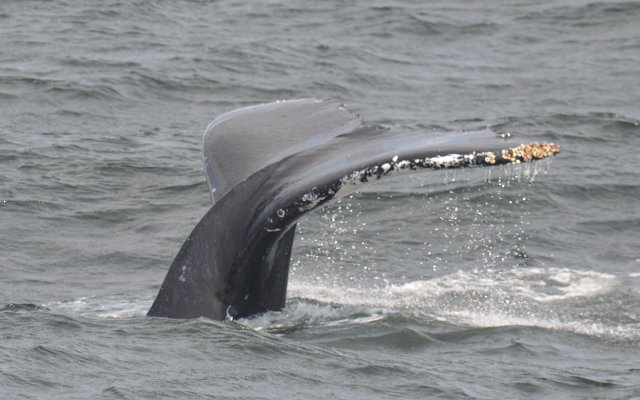 When we arrived at the Ledge, Pinball the humpback was deep feeding solo and we were able to observe her for a while. She was fluking consistently and popped up near the boat several times. It was great to have the fog lift so we could view one of our favorite whales of the season! Pinball diving | You can see barnacles attached to the side of her fluke. A humpback can host almost 1,000 pounds of barnacles! This morning on the Cetacea’s 9 a.m. whale watch, we headed north towards Jeffrey’s Ledge. On the way, we encountered thick patches of fog, limiting visibility greatly. We moved around quite a bit to continue searching, but unfortunately there were no whale sightings. All passengers were issued rain checks, just like the 10 a.m. trip.